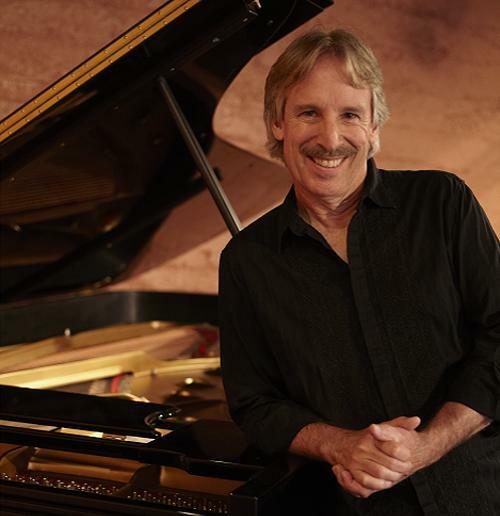 John Nilsen is a pianist, guitarist, vocalist and songwriter and one of the Pacific Northwest’s most successful performance and recording artists. Magic Wing, the record label Nilsen founded thirty years ago, has a catalogue of nineteen titles, all distributed internationally and most licensed outside the United States in numerous countries, including Germany, Great Britain, The Philippines, Canada, Taiwan and Singapore. Nilsen’s record sales far exceed a million copies. 230 of his compositions and arrangements receive BMI royalties. Nilsen’s first three titles, all piano solo records, were originally recorded and released with Eagle Records in Los Angeles. Nilsen is a prolific performer. Over the past thirty-five years, he has averaged 225 shows a year, performing as a solo pianist, solo guitarist and as a member of his two bands. John Nilsen and SWIMFISH, a folk-rock band, features John Nilsen/guitar, piano, vocals; Dave Captein/bass; Mike Snyder/drums; Bob Logue/guitar, vocals; and Don Woodward/guitar, harmonica, mandolin, vocals. The John Nilsen Trio, which performs a mix of folk, classical, jazz and rock, features John Nilsen/piano; Jeff Leonard/bass; and Jason Moore/percussion. Nilsen tours incessantly as a solo artist and as a member of his bands. He has performed countless times in every state, as well as overseas in Europe and Asia. He has appeared with such luminaries as Jose Feliciano, Jesse Colin Young, David Foster, Marc Cohn, Kenny G, Alex De Grassi, Montreaux and others. Nilsen is a native of the Pacific Northwest, born in Seattle and raised primarily in Portland, where he has been a resident for many years. Nilsen began studying piano at age six and guitar at age twelve. He attended Southern Oregon University, graduating with a Bachelor of Arts in English. He loves to get out on the rivers, into the forests and onto the mountains of the region. The people, landscapes, weather, and tenor of life in the Pacific Northwest frequently influence Nilsen’s musical themes. The late Dan Peek, founding member of the rock band America, wrote: “Major Kudos on your SWIMFISH CD. The music is superb, the lyrics inspired and the production/arranging is top notch. The songwriting hangs together well and the tracks flow, carving out a groove as naturally as a river carves a canyon. You deserve to be heard!” The Oregonian has written, “John Nilsen’s career is the envy of many musicians.” Three of Nilsen’s CDs have charted nationally: Where Rivers Run (1996), As Far As Near (2000), and Across Oregon (2002) which reached #8 nationally. In 1995, in recognition of his achievement and leadership in the performing arts, Nilsen was honored by his alma mater with the Distinguished Alumnus Award, the most prestigious award bestowed by Southern Oregon University on graduates. He was chosen to be a Deering Banjo artist in 2016 in recognition of his piano, guitar and songwriting talents. Nilsen speaks and conducts residencies on songwriting and musical performance at schools throughout the country, including every school in his home district outside Portland. He derives particular satisfaction from instructing and encouraging young artists. Nilsen’s newest release, Local Ocean, featuring SWIMFISH, was released in January 2017 and is distributed by SONY/RED/MRI. Recording sessions for Nilsen's 20th release are nearly completed and the forthcoming recording will be released in July 2019, release date pending. The piano based project will feature Nilsen’s piano compositions with orchestral backing. All John Nilsen CDs and sheet music books are available by calling Magic Wing at 503.657.4018 or by ordering from the Magic Wing or John Nilsen websites. John, who has performed in all fifty U.S. States countless times has toured Japan and Europe, including tours in 2013 and 2015. Nilsen continues to perform throughout the United States with regularity. For a complete viewing of John's performances please click on "live" at www.johnnilsen.com or www.magicwing.com.